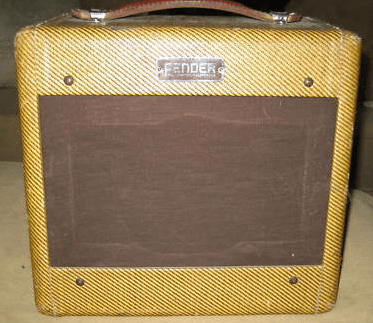 Another oldie but goodie – tweed Fender Champ serial number C 9055 (clearly marked on the tube chart photo all the way at the bottom of this post – how convenient!!). With this serial number and model number, we turn to reference the awesome work done by Greg Gagliano on determining how to date Fender amps by the serial number. For the 5D1 model Fender Champ, with a serial number of C 9055, his work tells us that this amp was made in roughly mid-1955. Looking at the tube chart again, there is a date code stamp of EE, which would correspond to May of 1955 – not a bad approximation just from the serial number! The handle and power cord look like they have been replaced.